Minister for PHE, Irrigation and Flood Control Sham Lal Choudhary today visited Katyal Gujjar Basti, R.S.Pura to take stock of damages caused to property and livestock by fire incident.Speaking on the occasion, the Minister said that the concerned departments have been directed to assess the losses and submit detailed report at the earliest for processing of compensation cases.The Minister was accompanied by Director Animal Husbandry, Victor Koul, SDM Naresh Kumar and other senior officers of the concerned department.It was also given out that administration has made adequate arrangements to provide ration and tents to the suffering families.Later, the Minister held a public grievance redressal camp at R.S Pura.Deputations from Karotana Basti, Suchtegarh, Gharani, Rangpur, Sai, Badila, Badyal Brahmana, Sher e chak, Mula Chak Panjgari , Bala Chak, , Bidhipur and adjoining areas participated in the camp . Deputations apprised the Minister of various issues of their respective areas relating to power, provision of electric poles, maintenance of transformers, construction of lanes and drains.Responding to the demands, the Minister said that the government has taken several initiatives to improve the socio-economic conditions of the people of the State and appealed the people to come forward and avail benefits of welfare schemes launched by the Government.He also directed the concerned to resolve the issues raised during the camp within stipulated time frame. He further added the concerned departments have directions to utilize the available funds in full and judiciously so that maximum benefits of development works are percolated at grass-root level.Later in the day, he conducted an extensive tour of border areas to take stock of damages caused to life, property and livestock due to cross border firing by Pakistan. 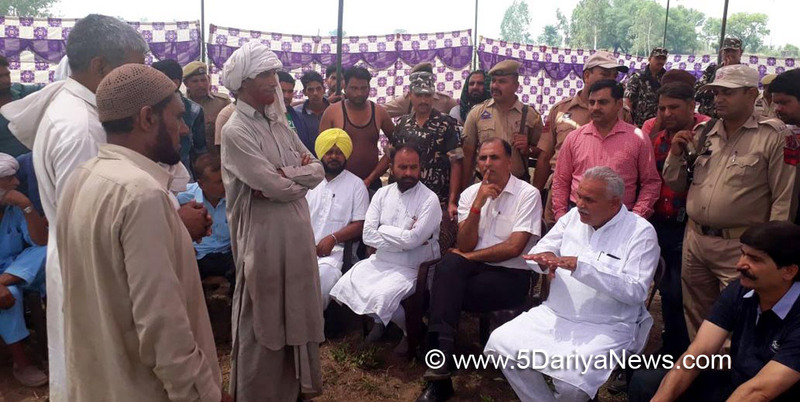 The Minister visited villages of the sectors including Korotana Khurd, Suchetgarh, Basti, Abdulla, Chanduchak, Samakha, Sai , Rapor and Sai Nikowal.Interacting with people, the Minister took stock of losses in the affected villages. He said that the concerned departments have been directed to assess the damages and submit detailed report within shortest possible time. He also provided assistance of Rs. 1 Lac to family of Bhajan Lal resident of Samakha who died in cross border firing.Sham Choudhary said that the concerned have been asked to take immediate steps for the treatment of injured animals and lifting of dead animals.Cautioning the people to avoid free movement in the area, the Minister said that police and civil administration is always at their service. He asked them to bring to the notice of local police if they find any live shell in their respective area to avert loss to lives.